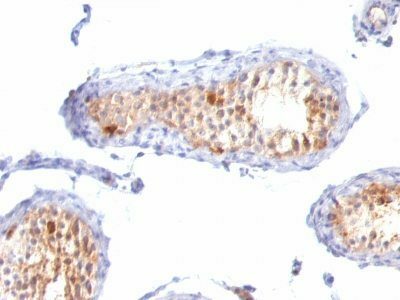 This antibody recognizes a protein doublet of 20-22 kDa, identified as MART-1 (Melanoma Antigen Recognized by T cells 1) or Melan-A. This antibody recognizes a protein doublet of 20-22 kDa, identified as MART-1 (Melanoma Antigen Recognized by T cells 1) or Melan-A. MART-1 is a newly identified melanocyte differentiation antigen recognized by autologous cytotoxic T lymphocytes. Seven other melanoma associated antigens recognized by autologous cytotoxic T cells include MAGE-1, MAGE-3, tyrosinase, gp100, gp75, BAGE-1, and GAGE-1. Subcellular fractionation shows that MART-1 is present in melanosomes and endoplasmic reticulum. 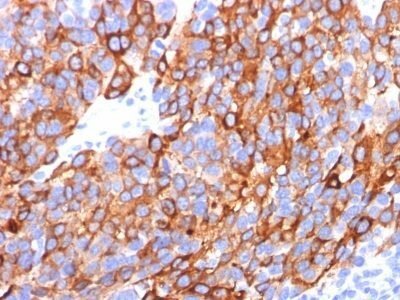 This MAb cocktail labels melanomas and other tumors showing melanocytic differentiation. It is also a useful positive-marker for angiomyolipomas. It does not stain tumor cells of epithelial, lymphoid, glial, or mesenchymal origin. Catalog number key for antibody number 0700, Anti-MART-1 (M2-7C10 M2-9E3 A103) The prefix indicates conjugation, followed by the antibody number and size suffix.